Sharpen your pencils - and your intuition - for this quick playing "think-in-sync" party game. Draw a category card and in 45 seconds, list as many related words that come to mind. When the timer runs out, roll the die - if it lands on HIT, pick a word that you think everyone wrote; if it lands on MISS, pick one that only you wrote. Choose wisely and score big points. The player with the highest score wins. Hit or Miss - the cant MISS game that will turn your next party into a HIT! 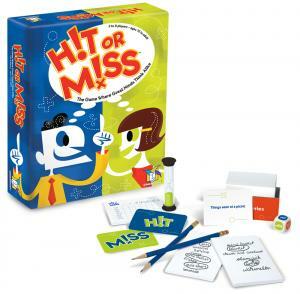 Had we included a category card titled â€œGreat party games,â€� Hit or Miss would surely be one of the top games on our list. We love how it incorporates many attributes that mark a fun party game: strong player interaction, opportunities to be creative, as well as a good combination of luck and skill. Strategy tip: This game rewards you both for being in tune with what your opponents are thinking as well as for creativity. Try to list an even number of common items as well as unique ones. This game seems to balance the length of play with thinking required very well and is one of my favorites. The game works because it'll keep flip-flopping at random between you trying to pick words that Everyone will guess and words that are so unique that Noone will guess. Changing back and forth between those keeps your brain active and keeps it from getting in a rut!